What does a bass fishing guide do on his summer vacation? Takes a trip to Lynchburg, Virginia for an annual fly-fishing challenge. For the past 4 years Orvis fly rods are dusted off and loaded up for the three-hour drive. For the past 3 years, my buddy Alan Friedlander and I fished the Upper James River. This year, the Staunton River, connecting Smith Mountain Lake with Kerr Lake, was our destination for two days of 10-mile floats. Our guide Capt. Matt Miles launched his drift boat and put us in position to make casts toward rocky-bottomed water only about 2 feet deep. On the right side of the river, Capt. Matt asked that I make backhand casts to avoid hooking him, as I was a left-handed caster. Oh no! Having a touch of elbow tendinitis, this wasn’t going to happen. On the other hand, most left-handers are quite good at going right. Not many concessions were made for leftys growing up. Right handed scissors, spiral notebook coils dug into hands, and ink pen smudges were dragged across the page. Forget about finding a catcher’s mitt for a southpaw. If there was a way to cast with the opposite hand, it was time to be a switch caster. On this adventure, two significant equipment changes were made. Conventional bass fishing allows matching line with different rods for specific lures and techniques. With fly-fishing the rod, for the most part, stays the same while line and leader change determined by the size and type of bait being cast. 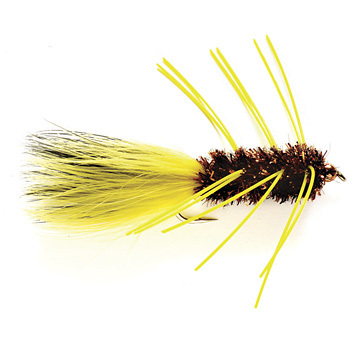 While still relying on GAMMA Frog Hair for leader, the fly line itself was changed. During last year’s outing, Capt. Matt noted my reel was spooled with trout line, designed for lighter flies. Fly-fishing is not only a foreign skill; it comes with its own language. At the advice of fishing industry pro, Jeffrey Pierce, trout line was swapped to a weight-forward bass line. This line up was supposed to enable longer casts. My Orvis Mirage reel was spooled with Scientific Anglers Mastery Titan Long WF-6-F, turtle grass/buckskin. Translated, this line was brown, floated and had a heavier tip for longer casts on my Orvis Helios 2, 6-weight rod. Changing sunglasses really helped. Seeing into clear water is pretty easy. Most polarized lenses will cut glare, but Maui Jim sunglasses go a bit further in being able to provide more contrast and color with High Transmission lenses. HT lenses enabled locating smallmouth as they darted from behind cover, approaching the streamer. Seeing them allowed me to pause and twitch to make them bite. Setting the hook came much quicker too! I got better at choosing a destination for my streamer and where strike zones were located. On this trip it was evolution time for baits. 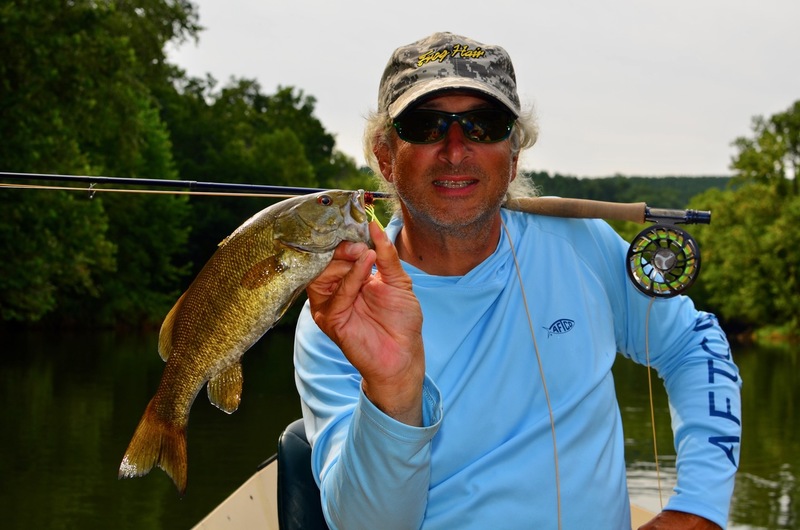 In previous trips, a cast with a floating bug drifted with the current and enticed smallmouth bass to attack. A cast and the floating lure drifted through the strike zone. After about 5 seconds, another cast presented the bait for another drift. Fish rushing to engulf the easy target created an unmistakable surface commotion. Not much angler input. On this outing, streamers were to be used. I was a bit reluctant when Capt. Matt said we would be stripping that day. I wasn’t sure what he meant and hoped he didn’t mean what I thought he meant. Turned out stripping was a method of adding action to sub surface lures. Taking to this technique, my strip tease began. Floating lures made learning to fly fish pretty easy. This trip was a graduation to working lures to get fish to bite. Stripping line moved the subsurface streamer in a horizontal presentation. Short strips needed to be coordinated with the speed of the boat to maintain line contact with the bait and to ensure a good hookset when a fish took it. Also, reducing the amount of line on the surface would avoid spooking line wary fish. This was a lot more involved and, since I was just learning how to use my opposite hand, it was additionally challenging. Time to introduce Staunton River smallmouth to the Orvis TeQueely Streamer, size 2. Not sure what this was supposed to be, but contrasting tail colors and rubber legs did the trick. Fish after fish after fish engulfed it. Watching them take it made for an exciting fly rod battle. Capt. Matt is so dialed in to what the fish want, I fed this fly to eager smallmouth, largemouth and spotted bass for two full days. Perfect weather; perfect fishing partner, and perfect equipment made for the perfect fishing trip. Lynchburg is an awesome city. It really does have everything, nice hotels, local eateries and chain restaurants, and fishing of course. Shorter days bring a weather change and cooling water. The month starts warm, but cools dramatically. Find grass remnants and look for hard cover in areas where grass has vacated. Topwater lures like Lucky Craft G-Splash along with Gunfish can be fished over grass remnants. Once you find fish, slow down and thoroughly fish the area. Stickworms with 3/0 Mustad Mega Bite hooks on Gamma 12 pound test Edge fluorocarbon line will work. Add a 1/8 ounce weight if grass isn’t too thick. At lower tides, fish grass line edges with small ¼ ounce Mann’s Classic spinnerbaits…gold blades with white skirt on 12-pound Edge. Also pitch Texas rigged Mizmo tubes on 3/0 Mustad Ultra Point tube hooks. Soak all soft plastics in garlic flavor Jack’s Juice bait spray. Mann’s Baby 1-Minus on 12-pound Edge can cover water to find grass and fish. Small Lucky Craft LV-100 lipless cranks in shad patterns can also be worked through grass. Add in drop shot and spilt shot rigs with 3/16-ounce Water Gremlin Bullshot weights on 10 pound test Edge.